Reel Talk Online: "Rise of the Planet of the Apes"
The summer of sequels, prequels, fivequels and remakes continues with a return to the planet of the apes. 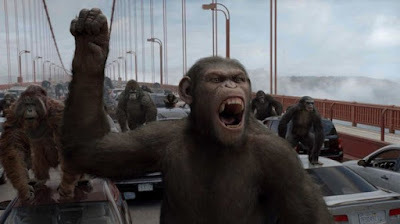 Rise of the Planet of the Apes is a prequel of sorts that is the first movie from the franchise that tells the apes' story, from their perspective. And it's actually pretty good. James Franco plays scientist Will Rodman, who thinks he's just found a cure for Alzheimer's Disease. After testing it on apes in his lab, he realizes there are unspecified side effects to the drugs and wants to put an end to the testing. Will takes in one of the apes and grows fond of it. While he's caring for his dad Charles (John Lithgow), who suffers from Alzheimer's, Will keeps an eye on the ape (who he names Caesar). Caesar shows signs of advanced intelligence and becomes as domesticated as an ape can be in Will's home. But one untamed incident proves to be a wake-up call for Will that Caesar should be in a facility with his own kind. 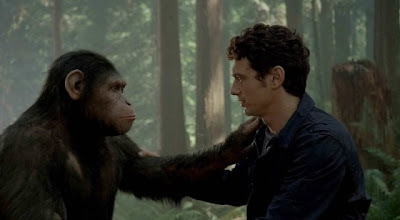 It is there that Caesar realizes how cruel humans can be and how abnormal it is to be an ape wearing a pair of pants and a t-shirt and attached to a leash. Among his own kind, Caesar experiences real life as an ape. And not just any ape; an ape whose hyper intelligence is both a puzzlement as well as a threat to humans. So what does he do with all these smarts? Start an uprising, of course. And it gets real ugly. Where it lacks in action, Rise of the Planet of the Apes makes up for it in a well-developed story with underlying themes of animal treatment and domestication. But is the apes that have the best lines in the movie and are far more developed--not to mention more interesting--characters. Perennial creature actor Andy Serkis (Lord of the Rings, King Kong) impressively blends the sensitivity of a human with the brutish force of a caged animal and the intelligence of chess champion. You root for him the whole way through, even when he's rioting in the streets of California. In essence, he is the heart of the movie. The emotions on his face in just one scene--like when he turns Charles's fork upright at the table when Charles starts regressing--are more fascinating to watch than the performances of any other character (human or ape) in the movie. Even the other apes were compelling to watch. How they interacted with one another, how they communicated, and how they reacted to their circumstances is a story in itself. It really makes you think about the whole idea of wildlife being contained in a zoo, and being fawned over by human passerbys. Franco is decent in a role with not a whole lot of depth. Will isn't a very layered character, and he's very ordinary. The only part where he shows any somewhat compelling emotion is in the scenes between him and Lithgow (who is pretty great here in a very against-type role). Freida Pinto seems to be riding on her stunning looks and not on any substantial amount of talent here. She plays Will's gal pal Carolina and a veterinarian. She doesn't have many lines. You'd think, given the way the story unfolds, that she'd have a lot more of an opinion about what goes on. Her character could have been much better developed. Having said that about the human characters, your main focus is forced to be on the apes, who steal the show by default. They are wonderfully-layered characters, but you wonder how captivating they would have been had the human characters been better sketched. Or, maybe the human characters were supposed to come off lame and ordinary to prove a point. If you're looking for an action-packed summer blockbuster, Rise of the Planet of the Apes is not the one. However, the entire last half of the movie is about as gripping as any competing action film out right now. The difference is this one has a real story that take the whole first half to tell you. It's a surprisingly provocative film that really stretches the definition of summer blockbuster. what really involved me with this film is that I felt attached to the characters, especially Caesar and kind of rooted for the apes in a way. Even though it does seem like they want to take over the humans as well. Good Review Candice! Glad you finally got to see this. Film of the year for me, along with Midnight in Paris. Serkis was amazing here and deserves an award, a nomination... he deserves something for this. I totally agree with you about the human characters, they were all very generic and boring. They could have been any old actors; obviously the big names like Franco and Cox were purely there to get people into the cinemas. All of the apes were amazing though, far more interesting characters than any of the humans. 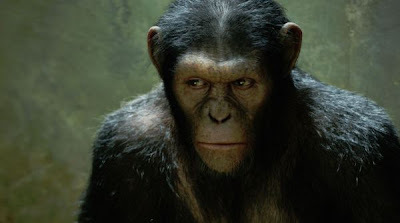 Good review and Yup I agree, the human characters were never as developed as the apes. I never thought Andy Serkis would win an Oscar for this role, but I thought he might bet a nomination for he was excellent. Acting without a dialogue is quite a task and was rewarded at the Oscars to Jean Dujardin for his dialogue less role in 'The Artist'.